Since cooking pork in a vat of lard isn’t something most people want to take on, it’s actually really easy to make a version at home using the Instant Pot or slow cooker that tastes just as delicious. The only catch is that you have to crisp up the pork after cooking it in the broiler or in a hot skillet. The most traditional way to serve pork carnitas is in a taco piled high with cilantro, white onion, salsa, and plenty of lime juice. It can also be used to make burritos, rice bowls, enchiladas, nachos, and quesadillas. And around here, I love piling it high on a big green salad with black beans and corn. Honestly, this is such a versatile protein, you can use it so many different ways. And it freezes well so don’t be afraid to make a big batch and keep some in the freezer for a quick meal. How to make Carnitas in the slow cooker? Instant Pot? Slow Cooker carnitas couldn’t be easier to make. First, you will want to trim a pork shoulder to remove extra fat and cut it into three to four large pieces. Then coat it in a spice rub using chili powder, cumin, oregano, salt, and pepper. Add some lime juice, orange juice, onion, and garlic. Then cook everything for about 8 hours on low until the pork is fork tender and easily shreds. 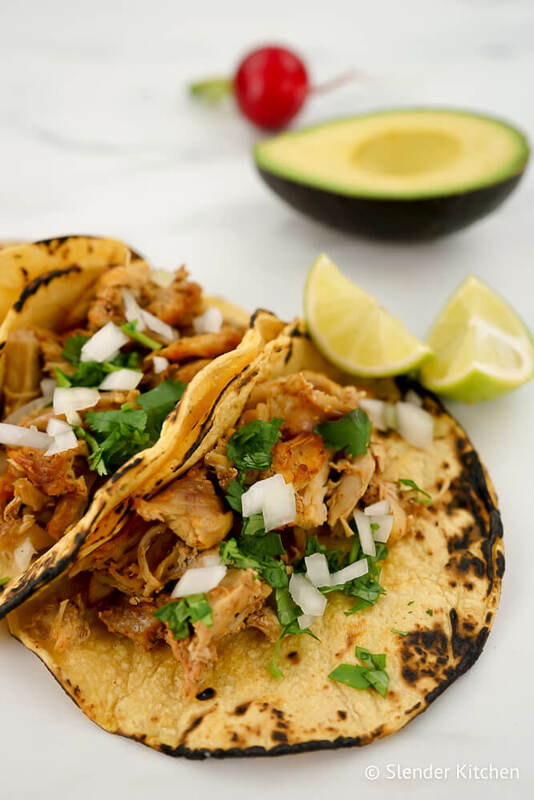 To make pork carnitas in the Instant Pot, you will follow the same steps to start. When it comes to cooking, just use the meat setting and make sure it is on high pressure. Cook it for 30 minutes and then let is naturally release. Shred the pork using two forks. 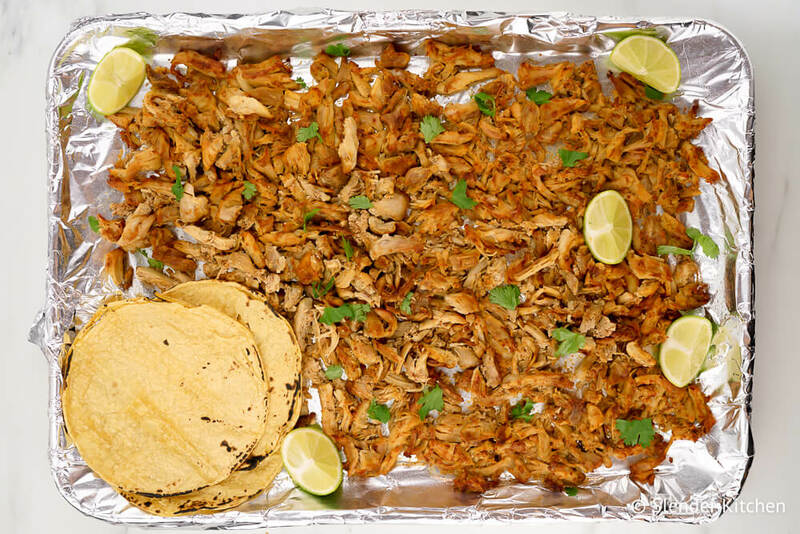 Finally to make things crispy, turn the broiler up to high and spread the carnitas out on a baking sheet. Broil for 4-6 minutes until they begin to crisp up and then toss with some of the cooking liquid to add flavor and moisture. Can I make Carnitas with chicken? Absolutely! You can use the recipe included here but replace the pork with chicken thighs instead. 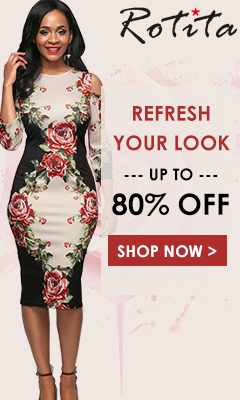 You will also need to adjust the cooking time. 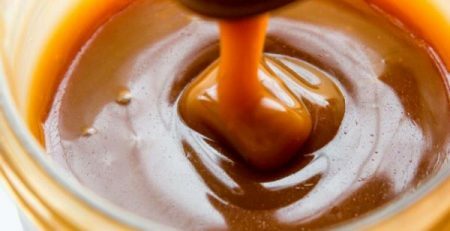 It will take about 4 hours in the slow cooker and about 20 minutes in the Instant Pot. 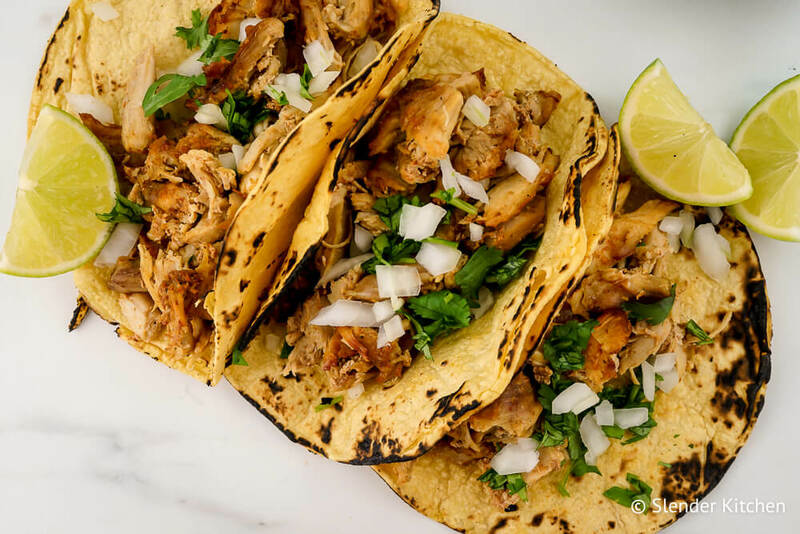 Here is a complete recipe for Slow Cooker Chicken Carnitas. What can I serve with carnitas? There are so many different options when it comes to side dishes for carnitas. The most traditional would be to serve it with refried beans, rice, and a stack of warm corn tortillas. Then each person can assemble their own tacos with fresh cilantro, diced white onion, limes, and salsa. Avocados or guacamole is also always on our table when Mexican food is involved. When we are eating carnitas tacos, I almost always serve it alongside some type of corn and black bean salad since it is something we all love and it keeps things light and healthy. Usually, I will serve some lettuce wraps as an option too for people who are eating low carb, Paleo, or Whole30. Then I like to use the leftovers for lunches in my own Chipotle style burrito bowls and salads. I toss in beans, corn, salsa, a little bit of cheese, and some cilantro lime brown rice or cauliflower rice. Calories 216, Total Fat 9g, Total Carbohydrate 3g, Protein 29g, Serving Size 6 oz.